It’s entirely possible that tonight’s dinner was the best I have ever eaten. It started with the recipe for Pasta alla Gricia from the January New York Times spread on guanciale that I mentioned in yesterday’s post. Pasta alla Gricia is arguably an ancient dish, made before the Italians had tomatoes (but obviously after they got hold of pasta from the Chinese). It consists of simply guanciale (now my favorite meat), onions, pasta, and cheese. But I had other issues to consider in preparing this dish. 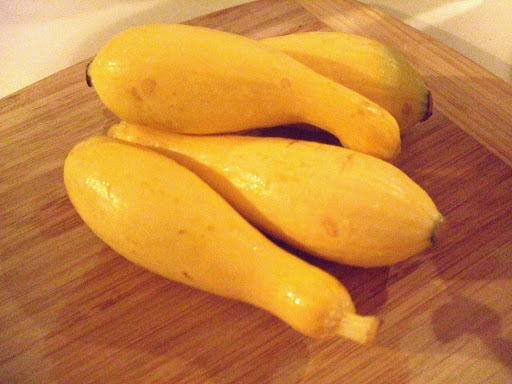 First, I had this squash from our Farmer’s Market expedition over the weekend. Second, I was too lazy to cook it separately. So I started by frying the guanciale, for once being a good citizen and following the recipe. I remained virtuous and added the onions. And then I stared at the squash for a long time. I could get out another pan, I thought. I could cut up another onion, a little garlic, add some olive oil, saute it all for a side dish. I could for once in my life maintain the purity of the original recipe and not add something else at the last minute just to see how it turned out. Or, I could just dump that squash right in. As is usual with me, Virtue lost. Undisciplined Possibility triumphed. Thank God for Undisciplined Possibility. I felt I showed admirable self-restraint by not licking the bowl. Put water for pasta on to boil. Fry guanciale on medium high heat in large skillet. When guanciale is beginning to brown, add onions and cook until translucent, stirring often. (Do not drain fat.) 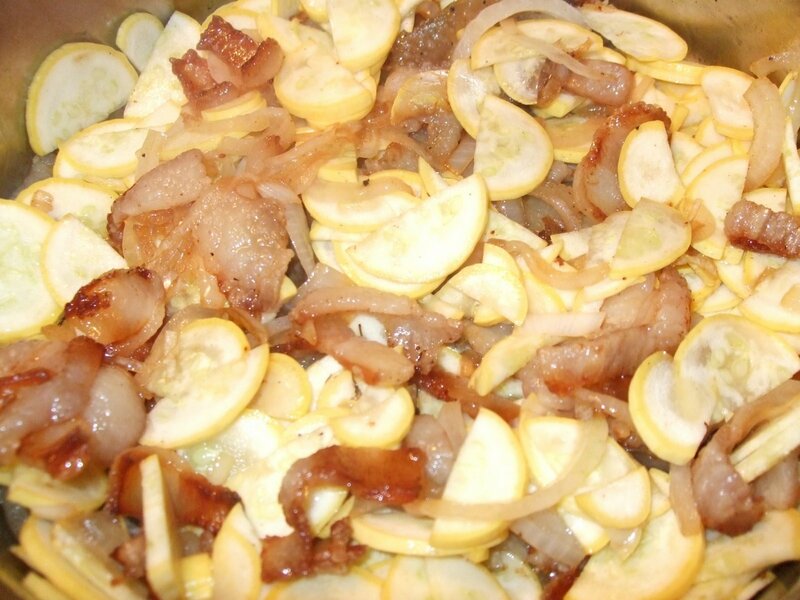 Reduce heat to medium and add squash; cook until squash is tender, stirring often. Cook pasta in boiling water until al dente. Drain over bowl to catch water. Add pasta to skillet. Add salt to taste and generous amounts of pepper. Add 1/3 cup cheese and 1/2 cup pasta water and cook over medium heat until cheese begins to melt. Add enough additional pasta water to melt cheese and coat pasta, stirring continuously. Serve with remaining cheese. This entry was posted in Pasta, Pork, Vegetables. Bookmark the permalink. “(Do not drain fat. )”isn’t that the key to every grand recipe?